Drowning in extra nuts from gift baskets? Use them in this tasty recipe that’s great as a low-sodium snack or for giving as gifts. 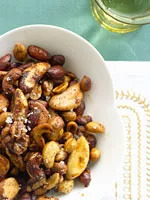 Plus, the nuts are full of heart-healthy fats and magnesium, while the spice mixture contains antioxidant-rich cinnamon.